http://www.amazon.com/dp/0345508998/ref … np_explore - includes preview of the novel in the link. interesting title. sounds interesting. don't have time to get into new clone wars book series however. I'm only about halfway through it, myself. Been reading it whenever I can find the time. Definitely doesn't read like the Republic Commando books, but it is a Clone Wars book, after all. Maybe it's just from reading it after watching the cartoon for the last few months. Of course, while reading it, you always hear the characters voices like they are in the cartoon. I am glad she included Pelleon in the book, though. I never read alot of the other Star Wars novels, so I hadn't even heard of him until the Legacy of the Force series. An Imperial with a sense of honor, who even made it through the Clone Wars and Palpatine's regime? There's something you don't see every day. Interesting character. Karen Traviss seems to do a reasonable job when writing novels associated with clones. So I might have to check it out, thanks for the heads up. For someone who's never read any of KT's novels, any title you guys could suggest as a good one to start with? I'm beginning to get into SW more since a little while, not sure why. I guess after all the time I've spent here as the orange in the apple tree, I feel like becoming less of a stranger in this strange land. I would recommened Hard Contact, the first of the Republic Commando books. Thanks for the suggestion, I'll try it. Tragedy makes a good book in my opinion. But I'm only about half way through True Colors, and thus far the only real 'tragedy' is the sapping of the story's pace by ALL the constant crying and hand wringing by........ everybody. The overkill on her theme of the 'poor abused clones' has been almost enough for me to quit reading her at times. She has several characters rolling in her story, but they're All THE SAME!!! Even Walon is breaking down now and fitting nicely into her little type-cast of identical characters. It's almost like she's incapable of writing a character with a different point of view then her own. I don't want to knock her too much. I'm reading on for historical context, but also with the hopes that this is just a phase and some different and interesting characters will emerge. Going back to why I like Hard Contact the best, it had a decent opposing force. The Sep. Mando was Mando, and he had a LOT in common with the Mandos we're reading about later, but at least he maintained his edgyness, AND maintained an individual mindset that was opposed to the other characters in the story. That's something I've yet to see in the rest of my reading. The old Han Solo trilogy by A. C. Crispin was really good; you get some good Old-School Boba cameos in the second two as well, even though it's not as fun since his hunts get spoinled. Even so, the author give him his due respect. And thanks again Mandal, I'll check the ones you mentioned too. Thanks, yours is quite cool too. Just me, with just the visor. Someday I'll make myself an armor to go with it. definitely take a look at the latest news article about Novall Talon. 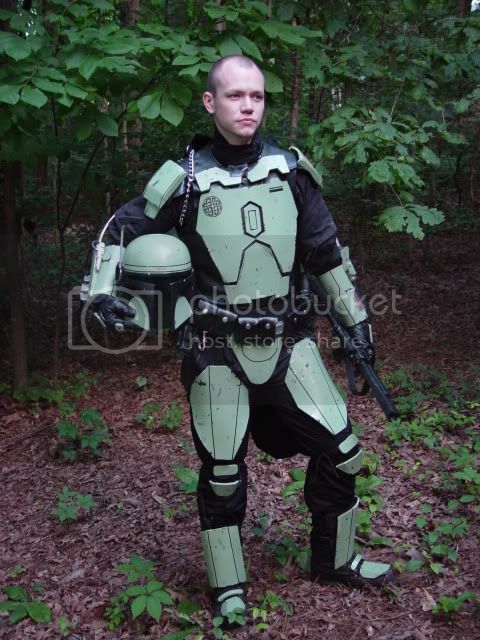 In it you'll find the link for the Mandalorian Mercs Costume Club. They helped me build my armor. Cool pic, your armor looks fantastic. I thought you had to have a decent armor done before you could join the Mercs' club. I was thinking I could go for a first try with metal wire and plaster sheets. Just to get a first contact with the kind of shapes I'll be working with. Then when it's time to paint it I was thinking I could find tutorials online or something. But I'll check the Mercs' site too. Thanks for the cue. Ok, Ok you two........thats enough flirting for one thread! Lets stay on topic, if private discussion is wanted, then private messaging is available. Not to be mean our anything.